I have a few easy roast venison recipes that I promise will deliver a juicy and flavorful piece of meat. 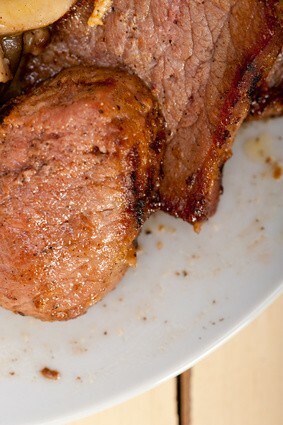 My homemade venison rub is a rock-star on this roast - a must try. You will have them coming back for seconds. Mix all of the dry ingredients together. Rub the roast (or chunks) with olive oil and then roll meat into dry ingredients. Meanwhile add 2 cups of beef broth in the bottom of a roasting pan. Place the meat in the pan and add the potato and onion quarters. Cover and bake for 2 hours. Let rest 15 minutes and thinly slice.